The Empire constructs a second Death Star above the forest moon of Endor. The Rebel fleet is massing at Sullust for a desperate assault against this superweapon. A small team of heroes descends to the planet surface to deactivate the Death Star’s shield generator. 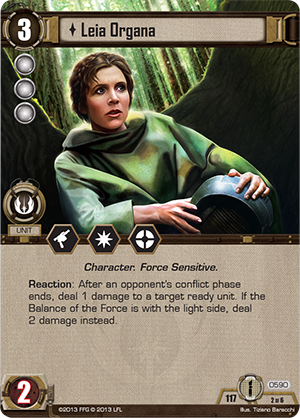 All the pieces are in place, and the Endor cycle begins with Solo’s Command, now available at your local United States retailer and online through our webstore! 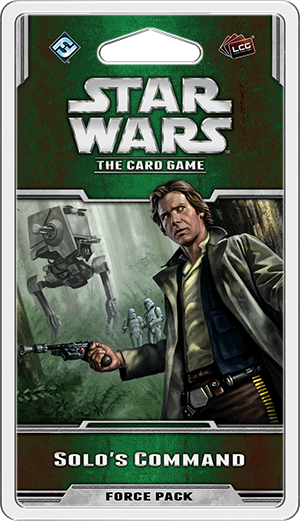 Like the other Force Packs in the Endor cycle, Solo’s Command introduces several new themes to Star Wars™: The Card Game. This cycle offers the first mission cards—objectives played under your opponent’s control that offer powerful rewards when destroyed. 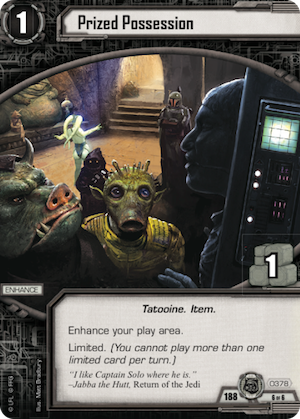 New fate cards ratchet up the tension in every edge battle and the return of neutral objective sets means expanded deckbuilding opportunities for every affiliation. Whether you prefer to relive the climax of Return of the Jedi or tell your own stories, Solo’s Command immerses you in the saga of Star Wars! Across the galaxy, Droids are used for thousands of tasks. They do work too dangerous for biological beings or labor unceasingly in the void of space. They can interpret thousands of languages to foster communication or perform the complex calculations necessary to pilot starships through hyperspace. They can wage war on behalf of their masters or serve drinks at an important function. Despite their countless uses and often-obvious intelligence, many Droids are treated as slaves by their owners. While some Droids are content with their lot in life, others have decided to throw off the shackles placed upon them and start a revolution against the biologicals! 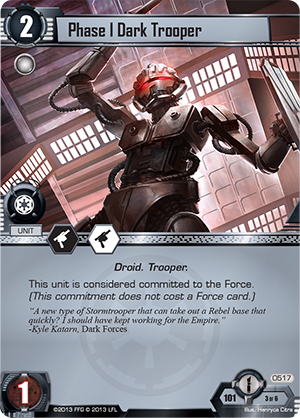 In Solo’s Command, you can throw your support behind the Droids of the galaxy with The Droid Revolution (Solo’s Command, 921). This objective boldly declares that your Droids will no longer be mistreated by their erstwhile masters. 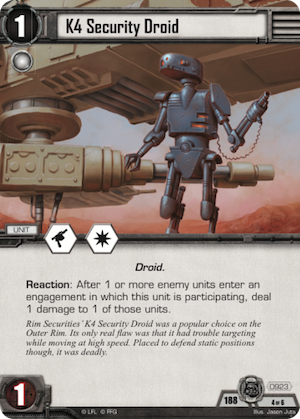 While you have The Droid Revolution in play, your Droid units cannot be damaged by enemy card effects or combat icons while they are not participating in an engagement! 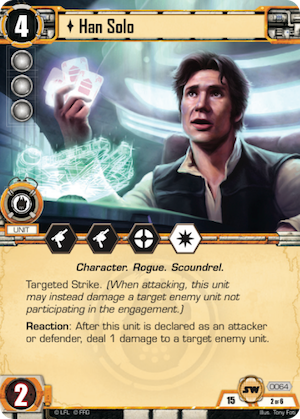 Not only does this objective give your Droids complete protection from targeted strike, it means they’re safe from light side cards like Han Solo (Core Set, 64) and Leia Organa (It Binds All Things, 590). 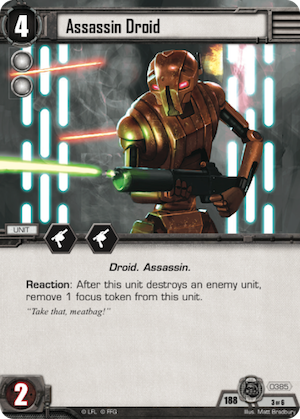 Not only does this set protect your Droids from harm, it offers plenty of Droids that can damage your opponent’s units and wreak vengeance upon their oppressors, starting with the K4 Security Droid (Solo’s Command, 923). This Droid is cheap to play, but its true power lies in its Reaction. After one or more enemy units enter an engagement in which the K4 Security Droid is participating, you can deal a damage to one of those units, enabling you to easily pick off weakened enemy units. You gain more firepower with the Assassin Droid (Solo’s Command, 385). 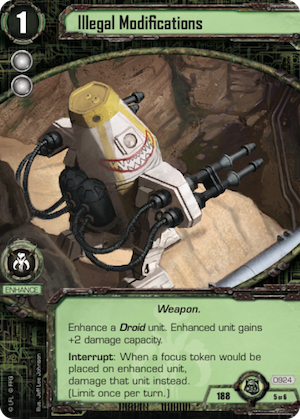 This Droid features two normal unit damage, and after it destroys an enemy unit, you can remove a focus token from this unit, potentially allowing it to strike again and deal more damage. Of course, the Droid revolution is nothing without a leader who can rally Droids across the galaxy. In this objective set, the leader is none other than IG-88B (Solo’s Command, 922), one of the deadly IG-88 Droids. First, IG-88B boasts the targeted strike keyword, and although he only deals one unit damage, his Reaction reads, “After this unit uses targeted strike to damage a unit, that unit is now participating in this engagement on its controller’s side.” As you lead the Droid rebellion, you can use IG-88B’s ability to pull exhausted enemy units into the engagement and quickly destroy them without fear of reprisal. That isn’t all that IG-88B offers you, however. 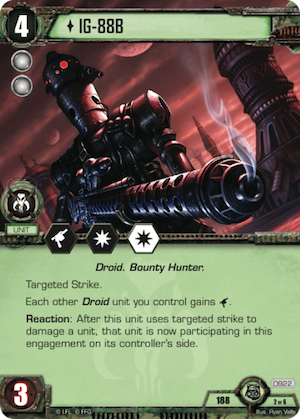 As the leader of the Droid revolution, he also grants an extra unit damage to every other Droid unit you control! Imagine the Reprogrammed DRK-1 Droids (It Binds All Things, 609) or the Phase I Dark Troopers (Heroes and Legends, 501) with extra unit damage. 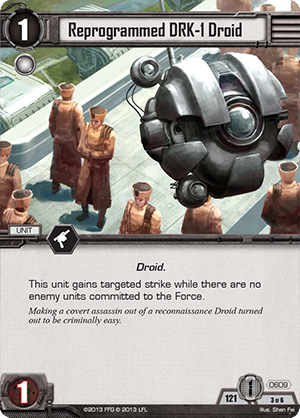 As you increase unit damage throughout the ranks of your Droid army, your opponent will quickly learn to fear those he once oppressed. Your Droids may be able to deal lots of damage, but many Droids also suffer from a low damage capacity. Fortunately, this objective set also offers the potential to enhance your Droids with Illegal Modifications (Solo’s Command, 924). This enhancement improves a unit’s damage capacity, and when a focus token would be placed on the enhanced unit, you may damage the unit instead, keeping it ready to fight! 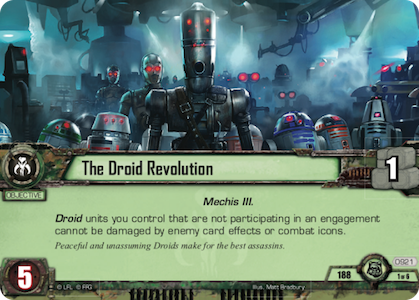 With Illegal Modifications, your Droids can deal massive amounts of damage, and the Prized Possession (Solo’s Command, 378) included in this set gives you the resources to muster an army and lead your revolution. The Droid revolution has begun! 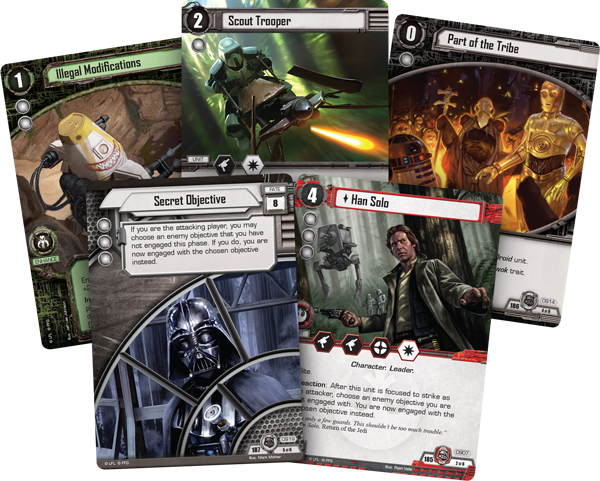 Support these mechanical freedom fighters or immerse yourself in the climactic events of Return of the Jedi with this Force Pack and the other expansions of the Endor cycle. Pick up your copy of Solo’s Command at your local United States retailer today.